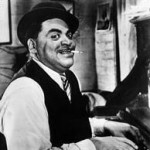 December 15, 1943 Thomas Wright “Fats” Waller, jazz pianist, organist and composer, died. Waller was born May 21, 1904 in New York City. He started playing the piano at the age of six. At the age of 14, he was playing the organ at Harlem’s Lincoln Theater and within 12 months had composed his first song. Waller was one of the most popular performers of his era, finding critical and commercial success in the United States and Europe. He was also a prolific songwriter and many of the songs that he wrote are still popular, including “Ain’t Misbehavin’” (1929) and “Honeysuckle Rose” (1934) which are in the Grammy Hall of Fame as recordings of “qualitative or historical significance.” A Broadway musical revue showcasing Waller tunes, “Ain’t Misbehavin,” was produced in 1978 and ran for over 1600 performances. In 1968, Waller was posthumously inducted into the Down Beat Jazz Hall of Fame, in 1970 he was inducted into the Songwriters Hall of Fame, in 1989 he was inducted into the Big Band and Jazz Hall of Fame, and in 1993 he received a Grammy Lifetime Achievement Award. His biography, “Fats Waller,” was published in 1977.